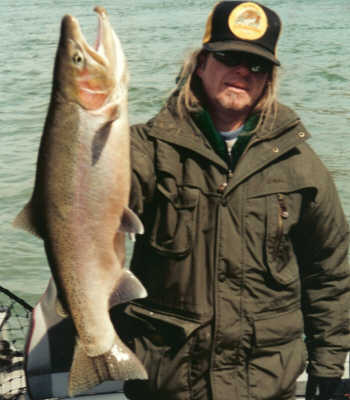 Pictured here is In-Fisherman Magazine Contributor Brett Richardson with some very nice Niagara River Steelhead. The Niagara River is one of the premier fishing destinations for anglers looking to catch a trophy Steelhead. 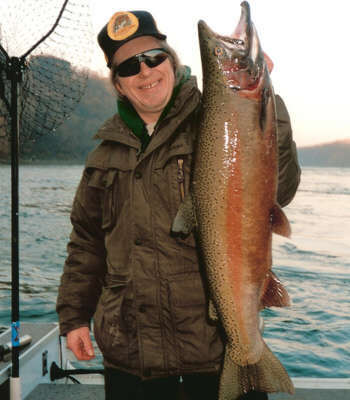 The Niagara River will hold Steelhead, Brown Trout, Lake Trout, Coho Salmon, and King Salmon all winter. In some years the trout are still here in the month of May before heading back to Lake Ontario. The lower section supports a fantastic fishery for steelhead, brown trout, lake trout, chinook salmon, coho salmon, bass, walleye, muskellunge, and perch. Most of the fish in the lower section of the river are from Lake Ontario, but find the waters of the Niagara River to be excellent habitat. These fish are able to go upstream as far as the falls. The Niagara River gorge is very steep and most fishing in this section of the river is by boat.